This project is a fascinating example of how extremely difficult physical conditions can be overcome to create a cost effective dry and safe environment. The project is located beneath a Bus Station in St. Ives, Cornwall. As the concrete slab over has busses turning on it, it can be seen that there will be considerable movement of the structure on a continuous basis. Such a situation requires a reliable and robust waterproofing system to ensure the area beneath is habitable and thus can be used for its intended purpose. By considerable excavation of rock and earth a cavern was created that was effectively beneath ground level. Barker Morris designed and installed a combined system to ensure that the area did not permit the ingress of water whatsoever. Cracking to the soffit of the slab was firstly repaired and then a cementitious barrier was sprayed on. This provided that the slab could still move but maintained its waterproofing integrity. 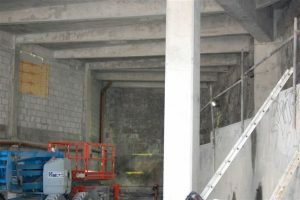 Cavity drained membrane was then installed to the walls and floor so that the complete area was sealed and capable of operating as a restaurant in the long term future. 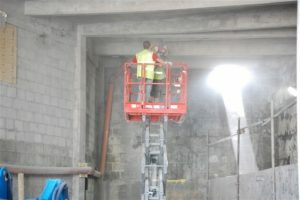 Constructed beneath a bus station, this unique development posed many waterproofing problems in terms of structural movement and the requirement to maintain a dry internal environment.